The subject of US Naval Aviation camouflage and markings is fascinating, but has always been a bit of a mystery to me. This was especially true of the "yellow wings" era between the wars, with a bewildering combination of bright colours on tails and bands and cowls, and fuselages adorned with a mishmash of digits. "First and Foremost" goes a long way toward deciphering the colours and markings of US Naval Aviation, using examples from Carrier Air Group One from 1934 to 1957. This is the second in the NAVA series from Model Publishing focusing on various US Naval Aviation subjects. This new book is presented in 8"x10" format with 136 glossy pages between soft covers. CV-4 USS Ranger was the United States' fourth aircraft carrier. Ranger undertook her shake down cruise from August 1934, eventually joining the US Fleet in April 1935. The narrative proper starts on 1 July 1938 with the official establishment of "RANGER Air Group". The text continues to Ranger's assignment to the Atlantic Squadron, Neutrality Patrol, through to the Second World W - War at Sea, Operation Torch, Operation Leader, CVG-4, the wing aboard USS Bunker Hill and Essex; then post-war aboard Tarawa, Westpac Cruise, Caribbean, aboard USS Philppine Sea, transition to the Jet Age, USS Coral Sea, USS Wasp, Mediterranean and North Atlantic Cruise, USS Roosevelt, CVG-1 and the Air Task Groups, USS Midway, the Suez Crisis aboard USS Forrestal, and wrapping up with the 1957 Mediterranean cruise on Forrestal. The text, covering such a wide range of assignments and operations over a twenty year period, is admirably succinct, logically organized and easy to read. The real value of this book though, in my opinion, is the contemporary photos, their captions, the inspirational colour artwork and the many tables summarizing aircraft strengths and markings at various periods. There are literally hundreds of black and white photos, plus a nice smattering of colour snaps. All photos are crisply reproduced with plenty of large photos to illustrate specific aspects of camouflage or markings. The tables are especially helpful in the Prologue section (pre 1938), Ranger and Neutrality Patrol chapters where they include colour coded designations to indicate squadron and section colours, plus the squadron and section code systems. This is the best explanation I have yet seen for the colours and markings of US Navy Yellow Wing era aircraft. These tables are further enhanced with carefully selected photos and useful captions. Although I am focusing on the complex pre-war era, the book deals equally well with the tri-colour, Gloss Sea Blue and Gull Gray periods over the next 95 pages too. The book is profusely illustrated with attractive and inspirational artwork reflecting the very broad range of aircraft to see service with Carrier Air Wing One over this period of twenty years. 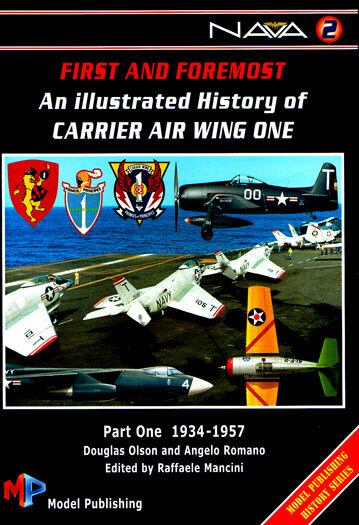 "First and Foremost - An Illustrated History of Carrier Air Wing One Part One 1934-1957" is a valuable examination of US Naval Aviation history, with a focus on colours and markings, through the case study of an important and interesting unit. This will be an essential reference for anybody with an interest in pre-war, WWII or post-war US Naval Aviation, and especially appropriate for modellers. I am looking forward to Model Publishing's ongoing coverage of US Naval Aviation. Thanks to Raffaele Mancini at Model Publishing for the review sample.